Includes bibliographical references (p. -283) and index. Blue paper-covered boards with gilt title etc. to spine. 1996-05-04. New. Ships with Tracking Number! INTERNATIONAL WORLDWIDE Shipping available. Buy with confidence, excellent customer service! 1994-01-08. New. Ships with Tracking Number! INTERNATIONAL WORLDWIDE Shipping available. Buy with confidence, excellent customer service! 1994-01-01. Good. Ships with Tracking Number! INTERNATIONAL WORLDWIDE Shipping available. May not contain Access Codes or Supplements. May be ex-library. Shipping & Handling by region. Buy with confidence, excellent customer service! 1994-01-08. Good. Ships with Tracking Number! INTERNATIONAL WORLDWIDE Shipping available. May not contain Access Codes or Supplements. May be ex-library. Shipping & Handling by region. Buy with confidence, excellent customer service! St Martins Pr. Hardcover. 031210510X New Condition. . New. St. Martin's Griffin. PAPERBACK. 0312143796 New Condition. . New. St. Martin's Griffin, 1996-06-15. Paperback. Used:Good. 1994, 1st edition, fine condition, with a fine dust jacket, with a priced unclipped dust jacket flap, published by St. Martin's Press, New York, 292 pages. 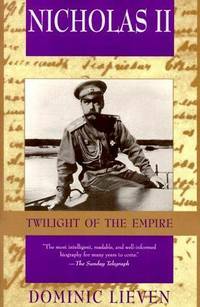 A new and revealing biography of the last Tsar of Russia; Nicholas II. Illustrated with photographs, and an extensive notes section. .
1996-05-04. Good. Ships with Tracking Number! INTERNATIONAL WORLDWIDE Shipping available. May not contain Access Codes or Supplements. May be ex-library. Shipping & Handling by region. Buy with confidence, excellent customer service! St Martins Pr, 1994-01-01. Hardcover. Used:Good. St. Martin's Griffin. PAPERBACK. 0312143796 Like New Condition. . Fine. St Martins Pr. Hardcover. 031210510X Like New Condition. . Fine. St. Martin's Griffin. PAPERBACK. 0312143796 In Great Condition Softcover ~ Slightest shelf-wear ~ PRISTINE pictures and text, AU22, * Your orders are meticulously inspected, packed securely, and shipped ASAP, quick responsive customer service insures customer satisfaction, , international and expedited shipping available for most items . Fine. St Martins Pr, 01/01/94. TRUE. Hardcover. VeryGood. First edition, first printing (full numberline). Jacket is present with a little shelfwear, but nothing severe. Text clean and unmarked. St Martins Pr. Hardcover. 031210510X Brand new. Excellent copy. . New. Pimlico, 1994-01-01. New Ed. Paperback. Good. New York: St. Martin's Press. Hardcover. 1993. 1st Edition. 8vo 292pp . Fine in Fine DJ. B&W Illustrations . London, England: BCA, 1994. Hardcover with red boards and pictorial dustjacket, edition not stated, 702gms, 292 pages. this book draws on the author's 15 year study of Imperial Russia to look at Nicholas II as a political leader and emperor. At the same time the book portrays the collapse of the Russian regime and the origins of Bolshevik Russia. Book is in very good condition with minor general wear and tear. Dust jacket is in very good condition with only mild shelf wear, otherwise no other pre-loved markings. . Edition Not Stated. Hardcover with Dust Jacket. Very Good/Very Good. 8vo - over 7¾" - 9¾" tall. NEW YORK: ST MARTIN PRESS, 1994 VG/VG, INK NAME ON FRONT ENDPAPER, 292 PAGES. First AMERICAN EDITION. Hard Cover. Very Good/Very Good. New York: St. Martin's, 1993. 292pp. Index. Wear corners, light soiling, DJ: wear extremities, rubbing.. Book Club. Hb. VG-/VG-. St. Martin's Griffin, 1996-06-15. Paperback. Very Good. Always free tracking and excellent packaging. All main text pages are clean, free of marks, and binding is tight. St Martins Pr, 1994-01. Hardcover. Good. St. Martin's Griffin, 1996. Trade Paperback. Very Good. Top corner of rear wrapper bumped, page ridges faintly foxed. 1996 Trade Paperback. xii, 292 pp. A biography of Russia's last monarch provides new insights into his infamous execution, his role as political leader and emperor, the Old Regime's collapse, and the origins of the Bolshevik Revolution. St. Martin's Griffin, 1996-06-15. Paperback. Good. Pimlico, 1994. Paperback. Good. Disclaimer:A copy that has been read, but remains in clean condition. All pages are intact, and the cover is intact. The spine may show signs of wear. Pages can include limited notes and highlighting, and the copy can include previous owner inscriptions. St. Martin's Griffin. Used - Good. Shows some signs of wear, and may have some markings on the inside. St Martins Pr. Used - Good. Good condition. Very Good dust jacket. Slightly dampstained. St Martins Pr. Hardcover. 031210510X Ships promptly from Texas. . New. 1994. St. Martin's Press, 1996. Paperback. Very Good. Disclaimer:A copy that has been read, but remains in excellent condition. Pages are intact and are not marred by notes or highlighting, but may contain a neat previous owner name. The spine remains undamaged. An ex-library book and may have standard library stamps and/or stickers. At ThriftBooks, our motto is: Read More, Spend Less.Dust jacket quality is not guaranteed. St. Martin's Press, 1996. Paperback. Very Good. Disclaimer:A copy that has been read, but remains in excellent condition. Pages are intact and are not marred by notes or highlighting, but may contain a neat previous owner name. The spine remains undamaged. At ThriftBooks, our motto is: Read More, Spend Less.Dust jacket quality is not guaranteed. St. Martin's Press, 1996. Paperback. Acceptable. Disclaimer:A readable copy. All pages are intact, and the cover is intact. Pages can include considerable notes-in pen or highlighter-but the notes cannot obscure the text. At ThriftBooks, our motto is: Read More, Spend Less.Dust jacket quality is not guaranteed. St. Martin's Press, 1993. Hardcover. Good. Disclaimer:A copy that has been read, but remains in clean condition. All pages are intact, and the cover is intact. The spine may show signs of wear. Pages can include limited notes and highlighting, and the copy can include previous owner inscriptions. At ThriftBooks, our motto is: Read More, Spend Less.Dust jacket quality is not guaranteed. New York: St. Martin's Griffin. Good. 1996. First American Edition; First Printing. Softcover. 0312143796 . Book is Good. Strong and sturdy binding with a slight forward lean. Very faint bumping and wear to cover corners and edges. About 19 pages of pencil underlining and pencil writing on false title page. Slight soiling bottom page ends. Very light surface shelf wear to cover. ; B&W Photographs; tall 8vo 9" - 10" tall; 292 pages . St Martins Pr. Used - Good. Shows some signs of wear, and may have some markings on the inside. St. Martin's Griffin. Used - Good. All orders guaranteed and ship within 24 hours. Your purchase supports More Than Words, a nonprofit job training program for youth, empowering youth to take charge of their lives by taking charge of a business. St. Martin's Griffin. Paperback. GOOD. Spine creases, wear to binding and pages from reading. May contain limited notes, underlining or highlighting that does affect the text. Possible ex library copy, thatâll have the markings and stickers associated from the library. Accessories such as CD, codes, toys, may not be included.